An artist's depiction of the private Mars One lander for a unmanned mission to Mars slated to launch in 2018. The design is based on NASA's Phoenix Mars lander. WASHINGTON — Mars One is gearing up to send an unmanned lander to the Red Planet that would follow in the mold of NASA's successful Mars landers. The Netherlands-based nonprofit has sealed a deal with security and aerospace company Lockheed Martin to develop a mission concept for its lander. This surface craft is slated to launch toward the Red Planet along with a communications satellite in 2018 — six years before Mars One aims to blast four people toward the Red Planet on a one-way colonization mission. "Phoenix is a proven delivery system," Ed Sedivy, a civil space chief engineer at Lockheed Martin who was the program manager for NASA's Phoenix lander flight system, said in a news briefing Dec. 10. "There are very few impediments to continuing on beyond the study concept." The objectives of the Phoenix mission, which lasted from May to November 2008, were to study the history of water in all its phases on Mars and to search for evidence of habitability. The lander had a robotic arm to dig through the top layer of soil on Mars to get to the water ice below, and it found evidence of water vapor in soil samples it heated up in an onboard oven. 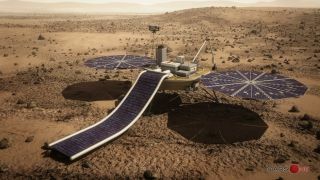 The planned Mars One lander will be very similar to Phoenix, Sedivy told SPACE.com. It will have a robotic digging arm for excavating the soil, as well as an experiment to extract water, the design of which has not yet been finalized. For power, the lander will sport two circular solar panel arrays, like Phoenix, as well as an experimental thin-film solar panel — the long "tongue" shown in the artist's impression above. Mars One co-founder and CEO Bas Lansdorp said the organization will open a call for proposals for the new solar panel, whose size will depend on the tradeoffs of payload weight and power-generating ability. "The solar panels will be very important for a manned mission, because we don’t want to depend on nuclear power," Lansdorp said. The lander will also have a camera, which will relay video from the surface of Mars to Earth via a satellite orbiter expected to launch with the lander in 2018. To help fund its manned missions, the first of which is slated to launch in 2024, Mars One has said it plans to organize a global media event around the colonists and their journey to (and stay on) the Red Planet. Lockheed Martin is also developing a Phoenix lander derivative for NASA's proposed InSight mission. InSight, which is slated to launch in 2016, will place a lander on Mars to drill down to investigate the planet's deep interior, in an attempt to understand the rocky planet's evolution.